This salad is one I cherished as a truly original and was a bit ashamed of it as it uses store bought canned sardines. I felt also like a foody snob who finds some low ingredients (such as the ubiquitous pig belly fat and sundry offal’s found on the menus of many high-end dining establishments) and try to prop them up for a fine dining recipes. Although many eastern states, such as Maine, had at one point an important canning industry and shipped sardines all through the country, what is commonly found comes from our Canadian neighbors. At home, I made it again — tweaking a few things and adding a boiled egg and more refined ingredients than what I had on hand in my haversack. I thought this recipe was somehow “original” and even thought of depositing a trade secret for it with one of my attorney friends. I could finally become rich. Then a neighbor from Sardinia (which I understand to be the land of the sardines) told me his grandmother after the war concocted something similar using wild greens from the fields in the Spring. If another human being had done it, it meant that there was something fundamental there, if not universal, to please the human palate. I always found that can sardines have more to offer than the serving suggestions on the wrapper: “Delicious on crackers, bread, toast, sandwich wraps or straight from the can. Add to your next open-faced broiled cheese sandwich”, dixit Brunswick Sardines IN OLIVE OIL! This salad has actually all the components of a balanced diet, rich in omega 3 I believe, and can make an excellent lunch salad as a meal in itself. 2 can of Sardines in Olive Oil—quality brand: count 1 ½ sardines for each guest. ½ red bell pepper: sliced thinly in the width to make circular shapes to halve. Drain sardines from the can, set them aside and reserve the oil. Half each sardine in length. If needed remove bones for aesthetic though they are edible and a good source of calcium and phosphate. If you want to make a more substantial meal salad, you may put whole sardines. In a hot pan, heat some fresh olive oil and on low heat cook garlic till light blond, and add shallot slices till translucent. Adding a bit more oil if needed sauté bell pepper for a couple of minutes on higher heat to make it a bit tender. Remove mixture from oil and set aside. When cooled down, mix them in the salad greens. In the same pan, add sardines and warm them gently for a minute. Remove them and set aside. Remove the pan from heat and while it is still warm, make dressing in it by some balsamic vinegar, Dijon mustard stirring vigorously to make a thin paste in which to emulsify the olive oill from the can. Integrate thyme and lemon zest. Adjust acidity and sweetness with balsamic vinegar. Pour over salad mixture and toss. Add grated parmesan and toss gently. Top salad with sardines heads pointing inward in a concentric pattern, each sardine at equidistant degrees from one another. Best served with some hearty toasted bread—unless you crave for that open-faced broiled cheese sandwich mentioned above. 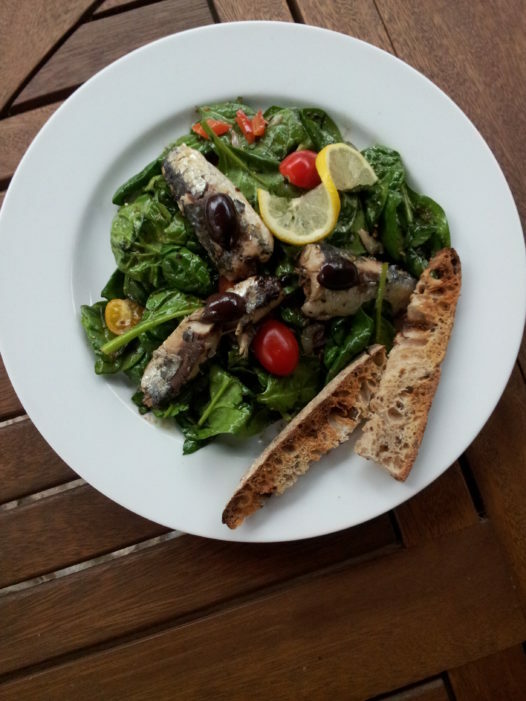 The Sardinian version of this sardine salad as it was conveyed to me add to the greens one sliced hard boiled for 2 guests. It is in a way reminiscent of a salade Niçoise, which is not totally surprising as in the ports of the Mediterranean a certain cousinship can be traced in the turning and the tossing of ingredients and people. Jean-Mark Sens grew up in France and Belgium and has been living in the Southern United States of America for the past 25 years, except for a short stint in the deep East of Maine, which brought him back to New Orleans. He has taught culinary arts at the Chef John Folse Culinary Institute, Eastern Maine Community College and more recently for Mississippi University for Women on the Gulf Coast, and also works with the Goldring Centre for Culinary Medicine in New Orleans. He has published a collection of poetry, Appetite, with Red Hen Press. The present recipes are part of Leafy Greens and Sundry Things, a book on the arts and technique of composing salads in need of a publisher.